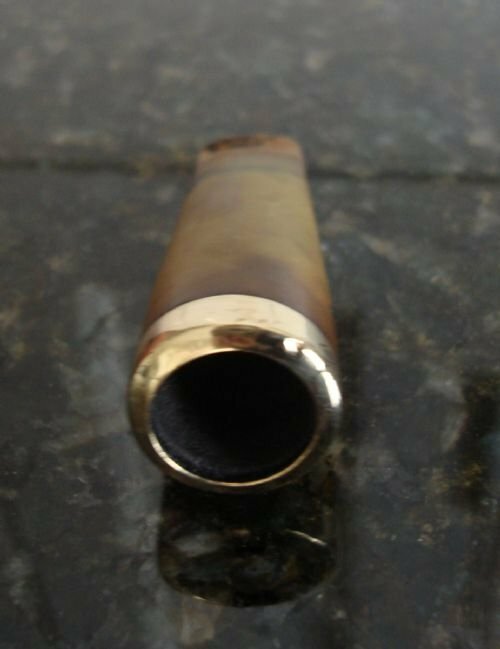 Early 20thC rare 18 carat solid gold cigarette or cheroot holder and original case. 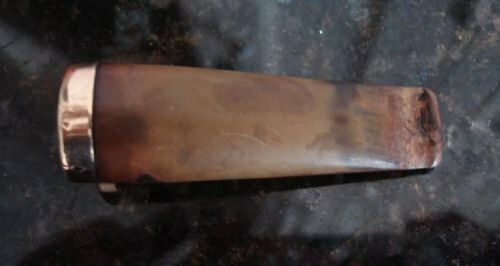 Early 20th century rare 18 carat solid gold long horn shaped cigarette or cheroot holder including the original pouch case. A beautifully crafted, and engraved holder. Very stylish in shape. 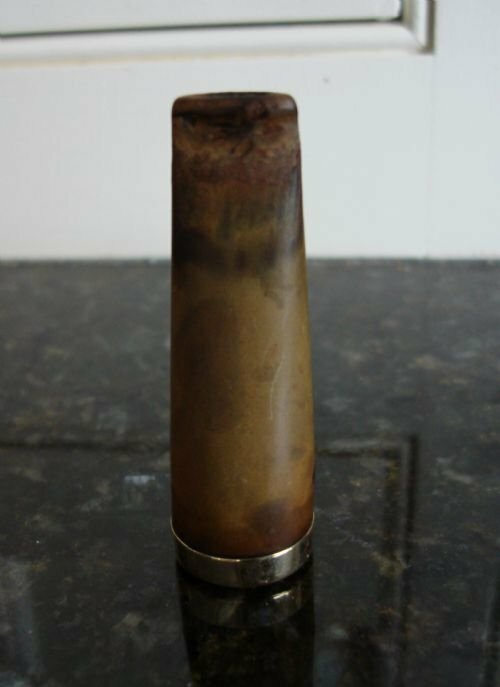 A lovely piece for the collector of small novelty gold items, smoking collectables, or a smoker. Size-4.5 inches long by .5 inches exterior diameter at end. Maximum interior diameter is 5/16 inches. 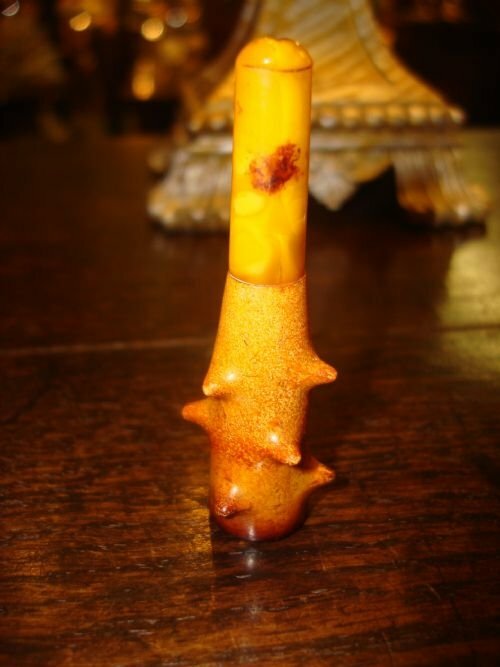 With only a couple of very tiny marks on the side of the horn, this very elegant and unusual holder is in very good, nearly as new condition. 18 carat gold is selling for top prices even at scrap value making this a wonderful investment as precious metal prices continue to soar. It is also a lovely collectable piece, evocative of an era long past. Presently at only fractionally above the price of scrap gold, this would make a great investment to hold as its worth continues to increase, as well as an iconic collectable! A great value for a beautifully crafted item in precious 18 carat gold, with its original case. A fine Birmingham 1905 hallmarked solid silver triple cigar case of torpedo form made by George Edwin Walton. Fine Birmingham 1905 English hallmarked solid silver triple cigar case made by George Edwin Walton of Birmingham, and Hatton Garden, London. This lovely cigar case has profuse all over bright cut engraving in a leaf and scroll design on both sides of the case. There is a blank cartouche on one side for personalisation if desired. The interior has the original gilt interior and elasticated retention band, and the hallmarks are well struck and clear. The case is strong and secure, and it closes tightly and springs open properly with the sprung push button. 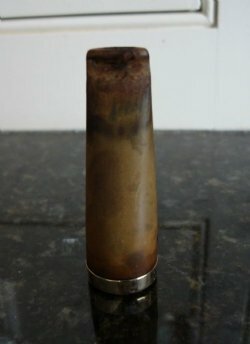 This type of cigar case is very popular and most attractive. It is a really lovely and unusually heavy case, beautifully made and engraved, and without damage. Size-5.25 inches long by 2.5 inches wide by .75 inches deep. Weight-120 grams or approximately 4 troy ounces. Perfect for the collector of novelty silver, or the cigar enthusiast. It would make a wonderful gift. 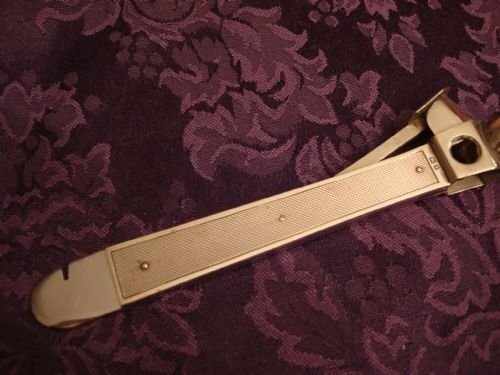 London hallmarked solid silver handled cigar cutter. 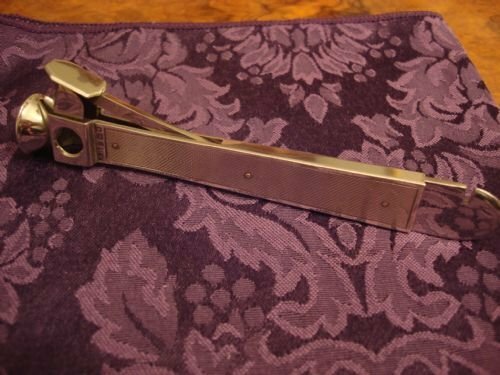 London English hallmarked solid silver clad cigar cutter tool. 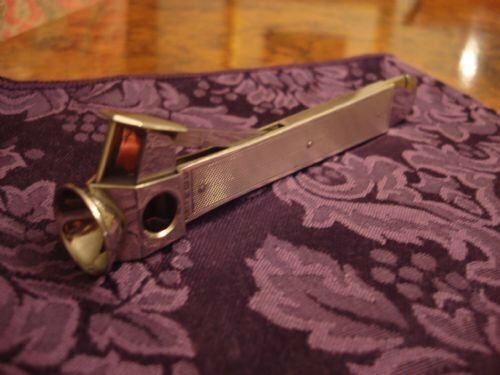 The balance of this large cigar cutter is steel, and made in Germany. This cutter has a notch at one end and the sprung loaded cutter blade at the other. These cutters are unusual to find clad in sterling. This very good piece is large and very suitable as a gift for the cigar aficionado to keep on the table or desk or inside a humidor. It has an engraved fully hallmarked silver handle. Size-5.75 inches long by 1.25 inches wide. A very handsome piece in very good condition for the cigar aficionado, in very good working order. 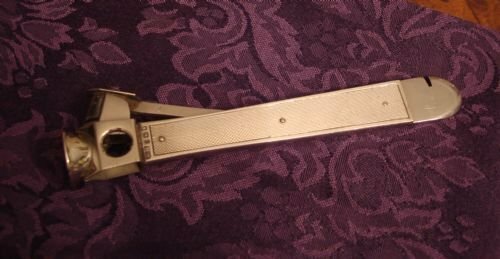 20th century vintage silver plate and mother of pearl cigar cutter. 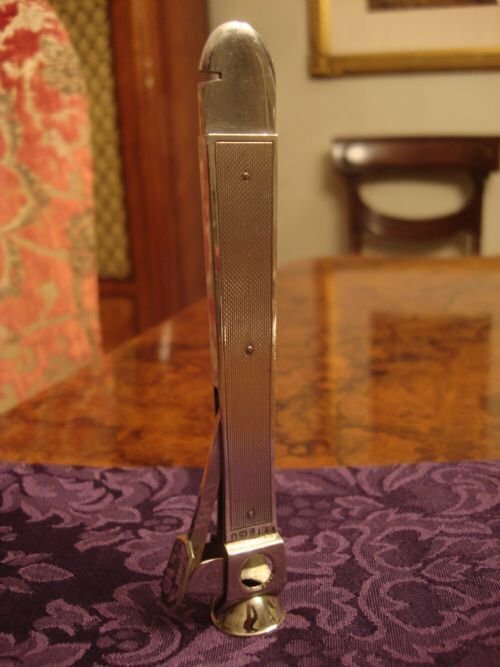 20th century vintage silver plate and mother of pearl large table sized cigar cutter. Lustrous mother of pearl, and silver plate, make this a great gift for the cigar enthusiast. Size-5.25 inches by 1 inch by 5/8 inches. 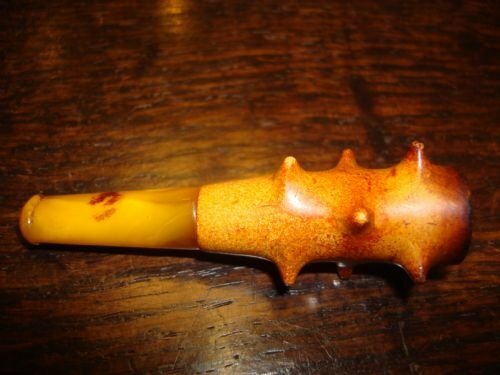 19th century meerschaum and amber cheroot holder. 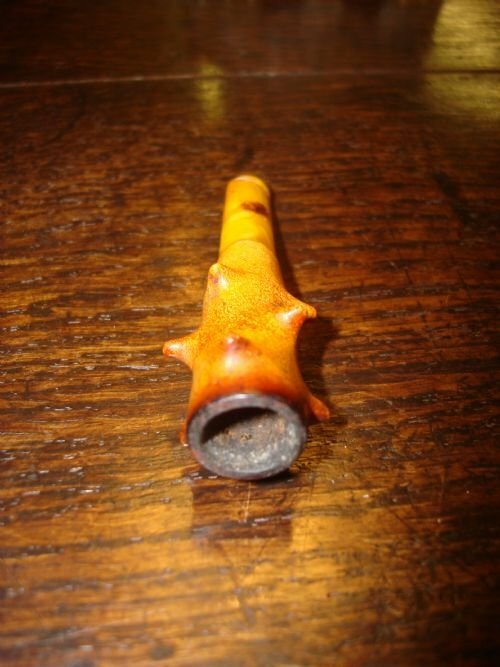 19th century meerschaum cheroot or small cigar holder with amber stem, having a beautiful patina and the colour that is only obtained by the heat of smoking. Size-2.75 inches long by .50 inches wide. Interior diameter is just under 7/16 inches. A very nice piece in very good condition. Early 20th century gold mounted Bakelite cigar holder. 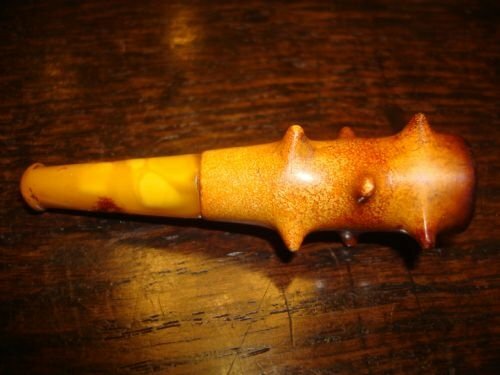 Size-2 5/8 inches long by .75 inches diameter. 9/16 inches inside diameter. 19th century superb and unusual Victorian solid oak cigar cabinet. 19th century beautifully crafted Victorian solid oak table top cigar cabinet with original bevelled glass doors, lock and key. The cabinet exterior is surmounted by a shaped cornice, and stands on a plinth base, with cabinet sides having beautiful canted corners. The lovely and unusual interior has three sliding trays at top, under a beautifully shaped interior decorative cornice. 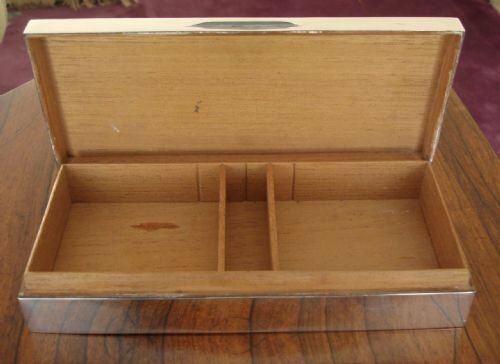 Two are sliding cigar/pipe racks for vertical placement, while the centre tray is undivided and open for placing things flat. Below these are four drawers and additional open space. Possibly, this may have originally been a shop cabinet, or was bespoke made for the personal requirements of an individual. One of the drawers has movable dividers, and all the original fittings and hinges are silver plated. All drawer backs as well as the back board of the cabinet are fitted with ventilation holes. Size-23 inches wide by 11 inches deep by 22 inches high. This is a very striking and unusual cabinet, like no other you have ever seen, and of excellent quality. In very good original antique condition. 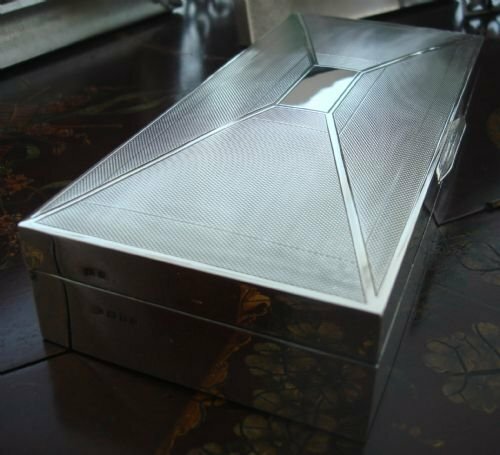 London 1935 solid silver large Art Deco period cigar or cigarette table box. London 1935 English hallmarked solid silver large Art Deco cigar box with sarcophagus shaped engine turned engraved top and blank cartouche to centre, made by the Alexander Clark Co. The geometric shape is very iconic of the Deco period. All the other sides are plain. Thumb piece to centre of hinged rising lid opens to reveal a fully cedar lined interior with removable and interchangeable dividers. The base is leather lined to protect the table surface. 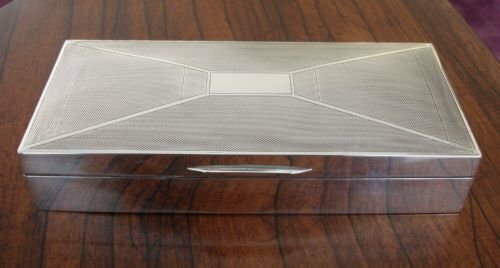 A very generous sized and very stylish silver box, beautifully made, and also suitable for cigars, cigarettes, playing cards, jewellery, or as a great desk tidy. Size-8 inches long by 3 5/8 inches wide by 1.75 inches high. Internal depth of the box is 1 inch. 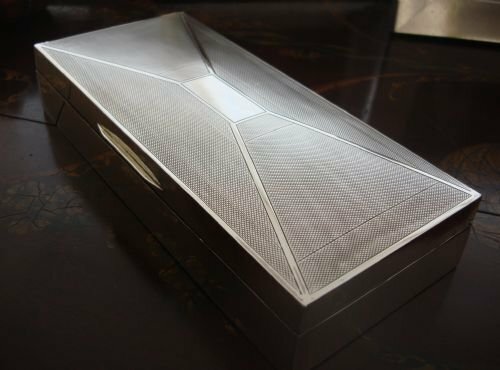 A very elegant and stylish silver box in very good condition, which would grace any table or desktop beautifully. 18th century Dutch hand wrought brass oval engraved tobacco box. 18th century (before 1750) Dutch hand wrought oval brass tobacco box with all over engraving, and profound textual expression. Dutch makers specialised in engraved boxes with common subjects such as humorous scenes of smoking, drinking, sports, domestic life, ships and sailors. The Netherlands was one of the biggest traders in tobacco and related products. Both lid and base are engraved with scenes flanked by text, and outlined by moulded bands. It is easier to connect east and west with a bow than to satisfy everyone. The balance of the box is all over engraved with lines and feathered decoration. The hinge is strong and very decorative, and the box closes firmly. Size-5.5 inches long by 3 inches wide by 1.5 inches high. This tobacco box is a very good size and weight, having a thick gauge of brass, and no damage or repairs. The centre portion of the engraving is a bit worn from age and use. The colour and patina is beautiful, and feels wonderful to hold. A great addition for the collector of brass, boxes, novelty items or antique smoking requisites. In very good overall condition, this is a lovely example of an early tobacco box. 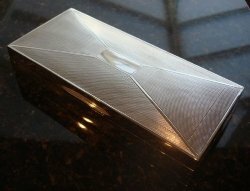 Birmingham 1908 solid silver profusely engraved cigar case made by G. Loveridge. Birmingham 1908 English hallmarked solid silver lovely quality cigar box or case, heavily engraved all over with foliate and bright cut engraving to both sides. Maker G. Loveridge and Co. This case is quite large and very good quality with a heavy weight and gauge of silver. The reverse side of the case has a graceful curve that is meant to fit comfortably against the body when carrying. The case opens with a full length hinge. Within a large lozenge shaped border is a very attractive engraved monogram, and the date 1909. Size-4.75 inches long by 3 3/8 inches wide by 7/8 inches deep. A very nice example of a cigar case, that is still useful for its original purpose, or for business cards, photos or carrying whatever you like. Given as a gift exactly 100 years ago, this would make an excellent gift to celebrate an important occasion. We have another similar one in inventory, not yet uploaded, and a three section one that can be seen online. Please check enquire, or check www.serpentineantiques.co.uk for the listings.